Tough guy on a tougher horse. If you are of a certain age, no week as a youngster was complete without watching Rawhide, a TV western series ran from 1959-1965, and starred a tall, young, handsome cattle drover we now know as Clint Eastwood. While the show was pure fiction, the real cattle drives of the 1800s were factual, and were, and are a part of the horse culture and historical fabric of North America. In the 1800s, it was estimated that there were five million cattle in Texas and by 1860 that meant about six cattle per person. Most of the cattle were descendants of the Spanish ranch and mission herds known as Longhorns with horns reaching four to eight feet wide. Meat was plentiful and nobody went hungry. However, while cattle were available for about $3.00 a head in Texas, people in the Midwest, hungry gold miners in California and people living on the east coast were willing to pay up to $80.00 a head. The great cattle drives were created to fill this need. Cowboys going on drives to California after 1850 were ready for a trip lasting five or six months, and this was no pleasure ride. The cattle were wild, unpredictable, and almost anything would set them off in a stampede. 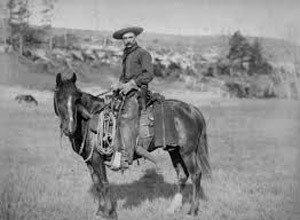 The cowboys were in the saddle for up to 20 hours a day, in the same clothes, in bad weather, and they often had to deal with Indians and cattle thieves. Stampedes were common, usually caused by the smell of water in drought situations, or by a bolt of lightening. If the drovers knew a stampede was about to erupt, they would turn the cattle to the right or left causing them to go into a circle. As the rest of the cattle approached they too were guided into this circle so that eventually the whole group was one walking mass in the tight circle. By 1857 the cattle drives to California had slowed down due to a glut on the market but the drives did continue thanks to contracts to supply beef to New Mexico, West Texas and Oklahoma. The drives virtually stopped during the Civil War years (1861-1865) but started up again in 1866. 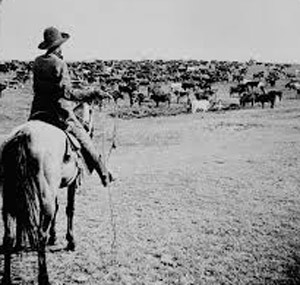 This was the year of one of the famous cattle drives that reached from Texas and north across the Red River. This river stretches 1,360 miles or 2,190 km across Texas where it acts as the border between the states of Texas and Oklahoma. In this history making event, 250,000 cattle were driven for stretches of 1243 miles or 2,000 kilometres at a time. Later, as railways opened up, the cattle were shipped to their final destinations by rail. As refrigeration and railways became commonplace, the great cattle drives began to decline in the mid-1880s. Fences were a rarity during the drives so branding was invented to help identify cattle. Burning a mark and cutting a small chunk of an ear in a very distinct pattern helped to identify cattle for owners. These brands and marks were listed in branding books held by municipal councils, and after 1778, the provincial government in San Antonio maintained the official branding book for all of Spanish Texas. The initial branding process often required the use of three irons to get the required design but later this would be changed to enable branding with just one iron. The drives began in the spring, and the head drover got the identifying tattoo and ear marks from each owner for his cattle. Then all the cattle were marked with the same “road” brand. It was usually a group of 12 men who would take the 2,000 to 3,000 cattle to their northern or western destination, and while the trail boss got paid $100 – $125 a month, the cook, who also acted as barber, dentist and doctor, was the next best paid at $60.00 a month. There were about 10 wranglers or “thirty-dollar men” per crew, and one wrangler was responsible for the remuda or spare horses, eight to ten for each man. 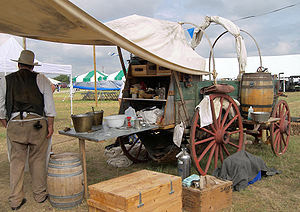 A mobile kitchen or chuckwagon. The chuckwagon for the cook was the invention of legendary Charles Goodnight in 1866, and was usually pulled by a pair of mules though oxen were also used sometimes. The bedrolls, food, utensils, water, and other supplies were put in the chuckwagon, and a pull down counter was used for food preparation. There was also another good use for a specially made chuckwagon and that was as a calf nursery. Until the advent of the chuckwagon, calves born on the drive were usually killed as they could not keep up. Goodnight knew that calves were of value so he started to give the new born calves a day ride in their special chuckwagon, and then left them out to spend the nights with their mothers. He eventually put each calf in a numbered sack, the same one each night so that the numerous calf smells did not get mixed up which confused the cow mothers. In 2003, Goodnight’s chuckwagon was named the “official state vehicle” of Texas. The trails that the drives followed were never the same, and as one historian said, “trails originated wherever a herd was shaped up and ended wherever a market was found.” This meant that thousands of minor offshoots from main trails were created. With the creation of the railways, some trails were discontinued such as the Chisholm Trail which enjoyed a peak year in 1871, but was closed down in 1884 as the interstate railway moved into the Midwest. Cattle Drives: Not an easy life. Cattle on a drive walked in a long strung out line that reached for miles. The cowboys were placed at key positions along the flank or swing line with the “pointers” or best men at the head of the group, and the drag men at the very end. Communications were done by hat waving, or hand signals adapted from the Plains Indians, and the drive usually managed an average of 10 to 15 miles or 16 to 24 kilometres a day. Cattle prices rose steadily from 1866 to 1870, and the Midwestern Drive in 1871 saw 700,000 Texas cattle moved to Kansas alone. However, bad times lay ahead, and the drive of 1872 was only half as big, many of the cattle were unsold and had to be wintered at great expense on Kansas ranges. By 1873 some cattlemen were bankrupt. The great cattle drives existed for only about 20 years after the Civil War, and the start of the railways made the drives unnecessary for northern markets. So, while the great cattle drives are history, the image of the tough cowboy, the “cookie” at his fire pit, and the long lines of dusty cattle will always be a part of North American history, legend and lore.